Eyebrows have come a long way. Let’s reflect for two seconds and happily mourn that thin parentheses eyebrows are a thing of the past now...if you don’t know what I’m talking about...just google Lily Van der Woodsen from Gossip Girl and you’ll see what I mean. Praise the greatness of Lily Collins and Cara Delevingne’s eyebrows!! They’re full, shapely, and make a statement. Thankfully I fall into the latter category, even if it means I regularly have to maintain them. Sometimes it crosses my mind what a big, wide world of skincare that we live in. I work in one of the biggest hubs of skincare that unveils the newest and innovative skincare products that I love to keep up with. Are you tired after reading that sentence? Me too. One of the integral parts of my job is really pinning down how someone’s skin functions from sunup to sundown. Just like the pasta wall at Harris Teeter, the options are endless when it comes to skincare products, even down to moisturizers! Hence why I ask 83453 questions whenever I help someone. Okay, maybe it's just me but these two weeks away from my blog have meant more to me than it probably has to you. In my job field, I try my very best not to be biased when it comes to the many brands I come in contact with every day. Sephora may enforce that, but at the end of the day, we’re still women and we’re picky and choosey. Women can be the most indecisive people ever...but we also know what we like. I really work to steer people where they need to go, resulting in a happy marriage of them and whatever skincare I’ve placed in their tender hands. My bathroom could represent the inside of a Sephora skincare section on a much, much smaller scale...however, there’s one brand that has a top spot on my counter (and under my sink). Sunday Riley has earned a permanent spot in my collection and I’m never ever letting her leave me. Well, in my humble and biased opinion, yes they do. When Into the Gloss first posted the Open Thread asking ‘Are Face Masks...Over?’ my heart stopped and suddenly I had a panicked thought, “No! Not in my house! Am I doing something wrong?’ Apparently, I wasn’t alone because they followed up with a closed thread (I guess) sharing the Into the Gloss’ readers thoughts, views, and uses of face masks. People rejoiced in their use of face masks...down to the wash off ones, sheet maks, and even the underrated, sleeping mask. I love face masks, they take up the most room under my sink (because I don’t have a top shelf like everyone else), and I yammer on about them here and here. But a sheet mask....not my cup of tea. I love an iced coffee thanks, just like I love an apply and wash off face mask. In the Youtuber version of my life, I’d be able to make updated beauty and skincare routine videos at the drop of a hat because of all the press boxes I’d probably be sent. Not that I’m complaining about my current status with my job now. I would NEVER complain, I am the most blessed with my job. ANYWAYS, I do try a lot of different things but I also keep my skincare and makeup routines pretty consistent when it comes to using the same essential products to make me, well, me. I change up my makeup but I do continue to grab the same things time after time. One of the most ever changing things in my routine, granted probably the only thing that frequently changes, are face masks. Everything else is consistent, but a face mask? Oh boy kids, what do we have planned for tonight?? You’re eating meatloaf for dinner? Well I’m slathering my face in some bizarre colored goo or paste to help my complexion look like yours even though you’re only eight years old. I’ve tried dozens but there’s a few that hold a place in my heart and under my bathroom sink. I know I am a self-proclaimed lover of Christmas, so much that it’s the time of the year where I truly thrive. Before I decide to cover everything in Christmas lights, my birthday comes first where I love to low key tell everyone I know that my birthday’s coming up. I do it to my mom every year and she almost always replies, “Yes Hannah, I know.” Sometimes I forget she was there...Anyways, I love my birthday! When else can you celebrate yourself and only yourself and have no one else judge you for being so narcissistic? That’s what I thought. Every year I always mull over what happened before entering another one. The things I seem to keep up are my abilities to be very dramatic and maintain my coffee drinking habit. Don’t worry though, I got other things done this year. Honestly this should be a post that I was able to crank out in five seconds because of how much I love and live for Charlotte Tilbury and everything she does. But instead, it’s taken entirely too long because how do you sum up some of your favorite makeup items of all time in one blog post? Well, let’s find out how I do such a thing...now. Truthfully, I’m not usually the cream highlighter kind of gal. Cream highlighters usually leave a more subtle, healthy glow and I go more for that glowing goddess kind of glow that you admire from afar. But I don’t mean that obnoxious beam of light that still blinds me on Instagram makeup artists (*insert air quotes here*). Even though creams aren’t my first pick for a highlighter, I still own some! Prepare yourself to read the words 'glow' and 'light' fifty times. Between cracking out my dry humor regularly, hitting up Starbucks every day, and my two jobs, I do find time to pop a face mask on and scroll through Instagram. Sometimes though, I get tired but I still want to mask. What’s a girl to do? Answer? A sleeping mask. It remains one of those objects where customers still scratch their heads when I mention it because they can’t wrap their minds around the concept. Yes, it’s a mask you can wear to sleep. They’re usually pillow proof too, so no mask goop will end up all over your precious pillow(s). Sometimes going to the beach means finding every item you think you might possibly need on that barren landscape we call the sand. I’m like a frantic mother trying to scramble around and gather everything before I jet out the door. Why am I like this? Going to the beach and doing nothing should be painless. And yet I need all the snacks, water, and sunscreen I can get once I’m out there. But now I’m a smarter version of myself with a stacked skincare collection and more ready than ever to get sand EVERYWHERE...but at least I can avoid a sunburn. One of the biggest conspiracies I found about being an oily skin type was that I didn’t need to moisturize my face. I was oily, clearly I didn’t need to hydrate. Wrong! Being oily is truly an imbalance of the skin’s equilibrium where it’s produced too much oil as a result of trying to hydrate itself. Since I stopped being ignorant and using moisturizer (in addition to other products I worked in), my skin has moved from a greasy landing strip to just a touch of shine on my nose (unfortunately not in the glowy, highlighter way). If I’m introducing anyone to skincare and they’ve got that wide-eyed look on their face, I only stress the two things I want them to use: a face wash and a moisturizer. For the love of God, I don’t care if you don’t use five products like I do. I can sleep happily at night as long as I know the people I help are washing their faces and slapping on some moisturizer before moving on with their lives. Get those two down, then come back and I’ll add on more. I tried to keep it easy and straightforward with my favorite moisturizers but honestly, they’re all different...except for maybe the underlying pink theme. I didn’t even think about making a blog post about this mascara but once I started thinking about it and how much I use it, I realized it needed one. No, it deserved one. Mascara is truly my favorite makeup product. Like, going to a desert island and I can only bring three things...mascara is going to be one of them. Even if I won’t see myself, at least everyone else (assuming I’m not embarking to this island alone), will be jealous of my lashes. My best friend and I were talking the other day about how off we feel complexion wise without our lashes lifted to the heavens and coated in multiple black layers. It makes us not even feel like ourselves. Ah, another skincare post *cracks knuckles*. I’m like a kid in a candy store when it comes to skincare, especially at my job. It’s like adventuring through aisles of aesthetically pleasing products that hold everything from stellar ingredients to promising results. There’s nothing like admiring your skincare products lined up on your bathroom counter. Don’t laugh at me, I know some of you do it too. How do I say that I hate overhyped launches or new products without sounding pretentious? I work at Sephora, where we always have the newest and hottest products from highlighters that can make you glow to the heavens or moisturizers that will fill your skin with hydration like a water balloon. I'm just picky with what I get truly excited about and look forward to. I’m all for a cheeky comment...or two. I live for the dry, funny moments where everyone pauses before they actually get my jokes that I supply on the daily. I also like to be overwhelmed with emotions whenever anyone compliments me ever. You can only imagine how excited I was when I discovered Frank Body and their catchy, tongue-in-cheek slogans on their natural, skin loving products. Everything they make is based around the most natural of ingredients, specifically coffee. Enter my caffeine addiction. Now I can put it on my face too? Sold. I’ve known about the Australian based company for a while since my friend tried it but I never around to trying it myself until a few months ago. Well, you could say we’re getting on really well. I present you with not only a Blessed post about Glossier, but also a quote from the legendary Cady Heron: ‘The limit doesn’t exist.’ But what makes us different is that she was talking about a math equation and I’m talking about makeup and skincare. Shocker I know, but Cady would respect me because I made my first Glossier order. Clearly I can’t have enough stuff in my collections. And Glossier’s theme color is pink, what’s better than that? I could never decide on what to order but I had some idea of what I wanted to try. The makeup didn’t really speak to me, other than Boy Brow, which my friend gave me. I also got the Haloscope highlighter stick too which is unlike anything I’ve ever owned. I finally placed my first order not too long after and decided to go for the Balm Dot Com and Milky Jelly Cleanser (!!). To be honest the makeup is more do it yourself/no brush needed which isn’t really my cup of tea. That makes me sound more difficult than I am but whatever. Glossier’s skincare was way up my alley, so I ordered the Milky Jelly Cleanser ‘cos everyone knows I’m a sucker for a cleanser. The Balm Dot Com is a uber loved by the masses via Instagram and everywhere else, the hard part was just deciding on which one to choose. My thoughts? Get ready. A skincare routine? In a box? Did Sephora just blow your mind? Did I just make your life easier with this post? Well, I hope it does. In honor of a new year and Sephora’s promise to help you achieve new, perfect skin, they released three skincare routine boxes covering the three skin types: Combination (which is sold out on Sephora.com now! ), Dry, and Normal. Now these can be a little flexible depending on your skin and other contributing factors. I went for the Combination box, which is full of products I’ve used before and love. Everything is the perfect sample size but I’ll probably tuck some away for travelling so I can leave my full size products at home. Prepare yourself as I try to sound super scientific when science is definitely not my strength and never will be. Micellar waters still baffle minds in terms of what they really are and how they work. According to Garnier, they claim micelles act like magnets to cleanse all traces of dirt, makeup and other impurities from the skin. In my not so scientific opinion, I would assume micelles are little molecules suspended in a water solution that attract dirt particles and reveal clean, soft skin. Wow, someone get me a PhD so I can add ‘Doctor’ to my name. I like using micellar waters as the first step in my double cleanse, especially on my eyes. For my first step I’ve been alternating between a Lancome Honey cleanser, Origins Original Skin Jelly, or Soap & Glory cleansing milk. But none of these need to go near my eyes so I opt for a micellar water to take off the five pounds of mascara that I love to wear like, every day. But if you don’t wear as much makeup as me and prefer a simplified makeup remover, have no fear, your perfect micellar water is here! Too Faced did that again with another stellar and deliciously smelling collection, exclusive to Sephora. 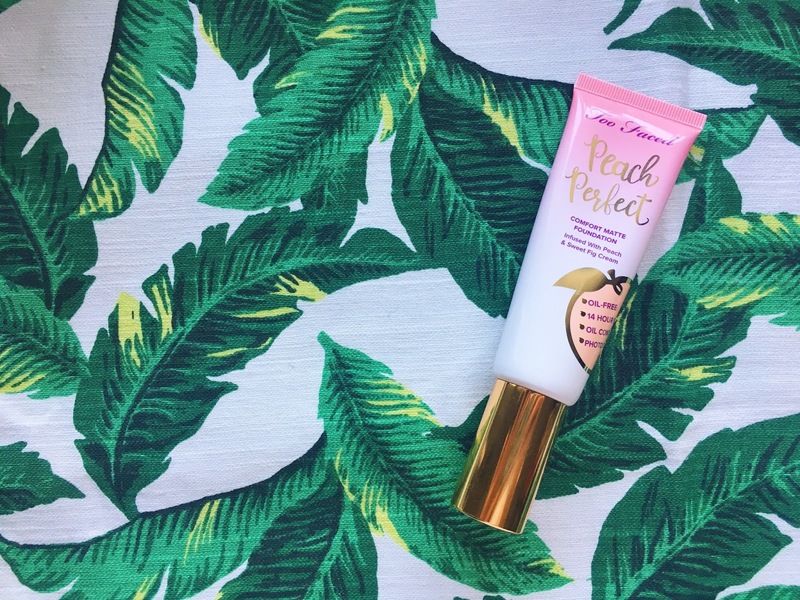 Peaches are here to stay, much to my happiness, with a new collection featuring Peach Essence and Sweet Fig Cream. This whole collection celebrates the embodiment of a peach and also the comfort matte look of the exterior of the beloved sweet summer fruit. Writing that sentence almost made me wish it was July again and I was eating a juicy peach. Sigh. The biggest question I've been asked about my trip was if London was everything I expected it to be. My answer every time? Yes, and then some. I'm gonna keep this short and sweet. London has some of the best shopping I've ever seen. As someone who knows some malls as well as my house, I was awestruck by all the shops and possibilities waiting inside. I didn't actually do as much shopping as I thought, but going in the stores on my list were well worth the experience. Enjoy! To be brief, if I wasn’t walking around London, I was probably eating. A majority of my trip involved public transportation, lots of coffee, and good food. Seriously, I ate so well in London, along with my best friend Amina. Thanks to some of my favorite Youtubers that live in London, I compiled a thorough list. Along the way, my friends also decided on places to eat that turned into some of the best places I ate. I truly became one of those people who takes pictures of their food. Every restaurant, coffee shop, or cafe, I was snapping photos before diving in. I mean, I also had to get some actual Snapchats in there too.